PP&P’s annual survey on compounding practice details improving compliance rates, notable technology adoptions, and evolving practices both in pharmacy and beyond. While compliance to compounding regulations falls within the purview of pharmacy, it is clear these efforts cannot exist within a vacuum. Rather, pharmacy must work collaboratively with other departments to ensure the safety of both staff and patients. 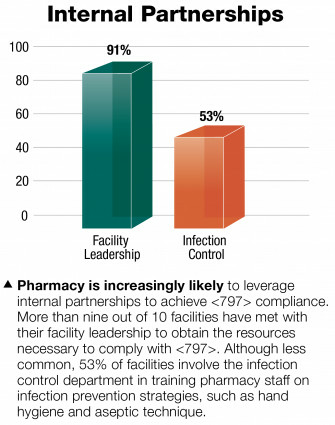 PP&P survey data shows pharmacy’s commitment to do just that as an increasing number of pharmacy departments leverage internal partnerships to improve compounding practices.